Bill Inkster shoots hoops from his 'chair. He played for Canada at the 1976 and 1980 Paralympics. He was a veteran on the Vancouver Cablecars team with such rookies as Rick Hansen and Terry Fox. 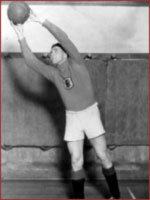 BELOW: Stan Stronge was a soccer goalkeeper before his injury. Sitting in his apartment in Terrace, Bill Inkster marvels at the Paralympians on television. Mr. Inkster, 69, has thickened at the waist since his playing days. He wears his jet black hair combed back. He speaks in the measured tones of a man in no hurry. Though you will never hear him say it, his own pioneering efforts helped contribute to making the Paralympics what they are today. They had no electricity or running hot water. They shut off the water pipes in winter. Young Willie, as he was known, played outfield on a boy’s softball team in summer, went skiing a few times when the local Catholic priest organized a youth ski club. After school on a Friday, he and friend would walk 20 kilometres to a favourite fishing hole, camping overnight, returning in time for class on Monday morning. On a fall day, he and an uncle went into the forest to cut wood about seven kilometres from their home. The boy scurried up a tree. Even all these years later, he recites the date as though it was a birthday — Nov. 23, 1957. He remembers waking at the base of the tree. He had landed on his head. His face began to swell. The uncle built a camp fire, lifted the boy into a sleeping bag, placed a tent over him. He then hiked back to Telegraph Creek to get help. They hauled him to town. He was flown to hospital in Whitehorse by the legendary bush pilot Bud Harbottle. The diagnosis — the T9 and T10 vertebrae were broken, one completely. They transferred him to Vancouver. He spent more than a year in hospital, including his 18th birthday, his day filled by appointments with physiotherapists and occupational therapists. A fellow named Stan Stronge came to visit. He had been a champion soccer goalkeeper with provincial and national championships, as well as prestigious starting assignments against visiting English teams. A versatile athlete, he had played baseball and been a competitive swimmer. On a blustery night in the fall of 1940, a southeast wind swept across the Lower Mainland, causing minor damage. Mr. Stronge was driving in North Vancouver when a 22.8-metre (75-foot) hemlock toppled onto his car. Mr. Stronge, the storm’s only victim, would not walk on a soccer pitch ever again. The athlete turned his attention to organizing wheelchair sports, which had more possible participants as the numbers of war wounded grew. 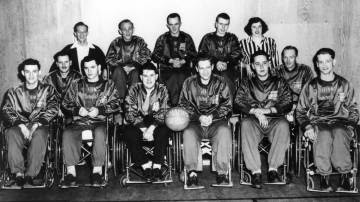 In 1950, Mr. Stronge helped form the Dueck Powerglides wheelchair basketball team. The team’s first exhibition match, at the new War Memorial Gymnasium on the University of British Columbia campus, attracted a crowd of 2,700. The Powerglides were a local powerhouse. On a tour of the region, they challenged teams of able-bodied athletes who used wheelchairs. The Powerglides won 74 of 75 games. The team’s roster included men who’d lost mobility from polio, or from car wrecks, or from logging accidents. One player, Pat Bell, had been shot in the back while trying to rob a bank. The team was sponsored by a car dealership for which Doug Mowat was a night tire salesman. Mr. Mowat, who had become a paraplegic at age 17 from injuries suffered at a party, later was later elected to the Legislature under the Social Credit banner. Mr. Stronge invited Mr. Inkster to join the basketball squad. He’d only ever once before played the game, but, in time, he became a stalwart forward. 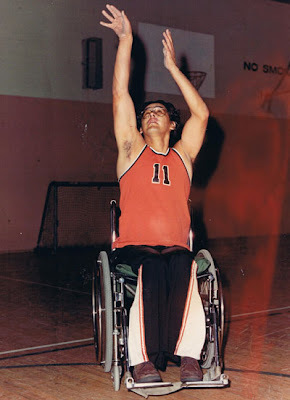 Mr. Inkster took part in wheelchair basketball as part of disabled games held following the Pan-Am Games at Winnipeg in 1967. Four years later, he finished third in archery at the disabled Pan-Ams in Jamaica. “The greatest bronze medal you’ll ever see,” he says today. The next year he set a national record at the Canadian National Wheelchair Games at Calgary. He also competed at the 1976 Paralympics in Toronto the 1980 Paralympics in Arnhem, the Netherlands. Mr. Inkster continued to roll across the parquet. The Powerglides got a new sponsorship from a cable-television company, so the team became the Cablecars. By then, he was a savvy veteran, used sparingly as young guns took on the responsibility of ensuring the team’s dominance. One of them was Terry Fox. Once, a wheelchair was seen as a mobile prison, which found expression in common language. You were confined to a wheelchair. Or wheelchair-bound. It took Rick Hansen and his round-the-world trek to show a wheelchair was a noun and not a sentence. Before the world knew of Mr. Hansen, and just at the point where Mr. Fox captured the nation’s imagination for his own cross-Canada run, Mr. Inkster, then aged 39, had to fill in for Mr. Fox as the Cablecars battled for the national crown at the wheelchair basketball championship in Winnipeg. The Dueck Powerglides of Vancouver were inducted into the B.C. Sports Hall of Fame last year. Shown above is the inaugural 1950-51 team. Bill Inkster joined in 1959.